NetControl.net Archive of ::SMOKE Magazine Online! 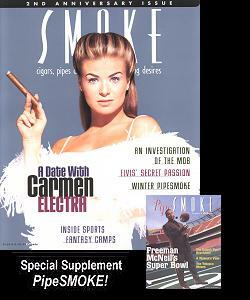 The distinctive lifestyle magazine geared to the cigar and pipe enthusiast. "New Message Playback" A message from SMOKE's editor-in-chief. PipeSMOKE! Holiday Pipes, the Danish Pipe Revolution, and more! Feature Article... Connecticut Quality Cigars - The story of Topper Cigar Company. "Capital Smokes" Prowl the cigar haunts of our nation's capitol with SMOKE! Shopping Guide... Visit our advertiser's online showrooms! SMOKE Reviews... Winter smokes and flavored cigars in SMOKE's largest review to date. SMOKE Links... Some of the best informational cigar sites on the Internet! Le Cigar Noir... SMOKE's Special cigar nights is coming to a city near you! Write us.... Stay in touch via SMOKE magazine's online Mail Room! SMOKE's Archives Browse special features, reviews, and more, from our back-issues. Subscribe to SMOKE! Haven't subscribed to SMOKE! yet? What are you waiting for??? SMOKE Online is a recent winner of the 2ask Best of the Planet Award, Yahoo's Top Five Cigar Sites of the Internet, and the new Snap! Online Best of the Web Award! HTML production and Copyright © 1997, Keys Technologies and SMOKE Magazine. All rights reserved.